San Francisco's Disco .vs. 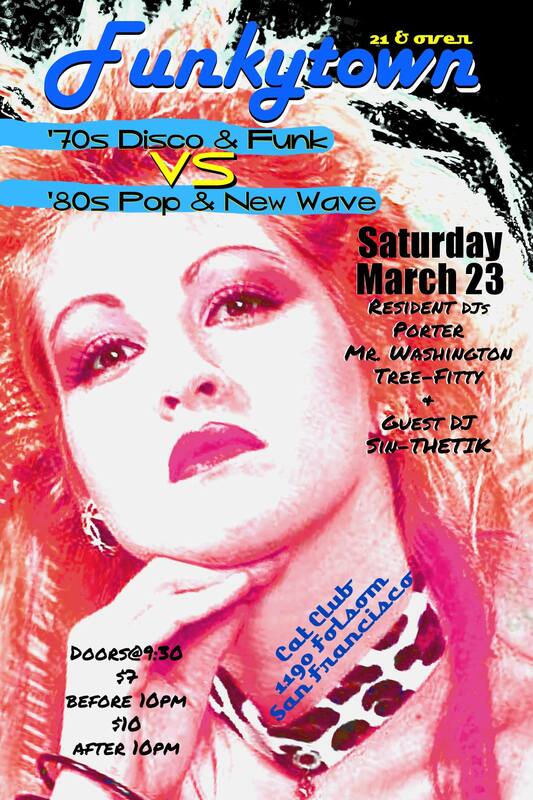 New Wave dance party returns on Saturday, March 23rd! Come join us on Saturday, March 23rd, at the Cat Club in San Francisco! 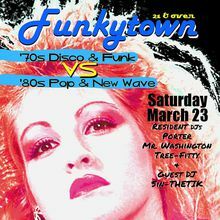 Come get your groove on with regular Funkytown DJ's Porter, Mr. Washington and Tree-Fitty, with special guest DJ Sin-Thetik (Planet Earth) as they play all the top disco and funk hits of the 70s in the backroom, and all the new wave and pop hits of the 80s in the front room. In the Back Room, Featuring 70s artists and acts such as: The Bee Gee's, Kool & the Gang, Donna Summer, K.C. and the Sunshine Band, The Gap Band, Jackson Five, Isaac Hayes, ABBA, Shalamar, The Supremes, The Village People, and many more! In the Front Room, Featuring 80s artists and acts such as: The Cure, Michael Jackson, Human League, Gary Numan, Madonna, Whitney Houston, Frankie Goes to Hollywood, Depeche Mode, The Smiths, Duran Duran, The B52's, Oingo Boingo, Adam Ant, New Order, Book of Love, Flock of Seagulls, Prince, Wham and more! Doors open at 9:30pm, $10 Cover ($7 before 10pm), 21 and over.